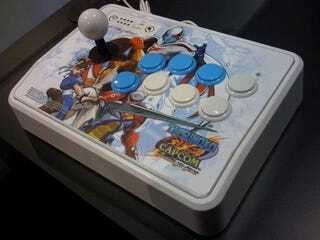 Capcom reports that Mad Catz swung by their Comic-Con booth yesterday to show off this slick Tatsunoko Vs. Capcom: Ultimate All-Stars fight stick. It sounds like the non-working Wii mock-up still needs final approval. Capcom says that they have it at their booth to see what gamers think of it. What do you think?